Baldwin, R (2016), The Great Convergence: Information Technology and the New Globalization, Cambridge, MA: Harvard University Press. Baldwin, R (2019), The Globotics Upheaval: Globalization, Robotics, and the Future of Work, Oxford University Press. Bughin, J and S Lund (2017), “The ascendancy of international data flows,” VoxEU.org, 9 January. Djankov, S, C Freund and C S Pham (2010), “Trading on time,” The Review of Economics and Statistics 92(1). Freund, C and D Weinhold (2000), “On the effect of the internet on international trade,” Board of Governors of the Federal Reserve System International Finance Discussion Paper No. 693. Hausman, W H, H L Lee and U Subramanian (2013), “The impact of logistics performance on trade,” Production and Operations Management 22(2). Lund, S and L Tyson (2018), “Globalization is not in retreat,” Foreign Affairs, May/June. McAfee, A and E Brynjolfsson (2017), Machine, Platform, Crowd: Harnessing Our Digital Future, New York, NY: W W Norton & Company. 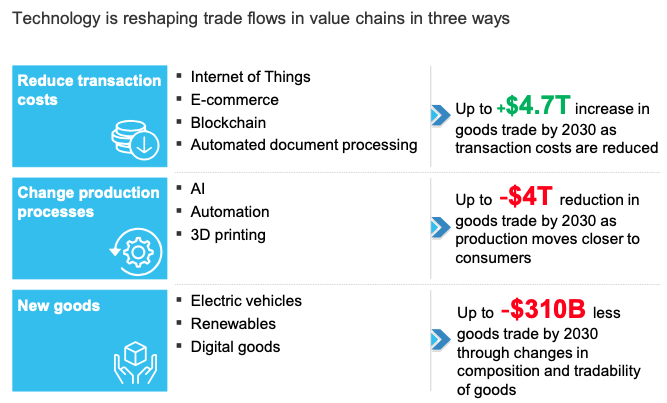 McKinsey Global Institute (2019), Globalization in transition: The future of trade and value chains, January. McKinsey Global Institute (2017), Jobs lost, jobs gained: Workforce transitions in a time of automation, December. McKinsey Global Institute (2016), Digital globalization: The new era of global flows, March. Miroudet, S and C Cadestin (2017), “Services in global value chains: From inputs to value-creating activities,” OECD Trade Policy Papers 197. Timmer, Marcel et al. (2016), “An anatomy of the global trade slowdown based on the WIOD 2016 release,” University of Groningnen Growth and Development Center, Research Memorandum 162. World Trade Organization (2018), World trade report 2018: The future of world trade: How digital technologies are transforming global commerce, October.